Take your pick, or get them all together. 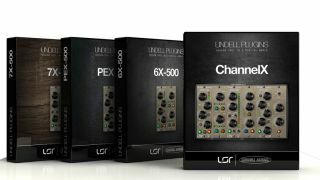 Lindell Audio has announced a new range of plugins based on its existing hardware products. It comprises a compressor, an EQ, a mic preamp and a channel strip plugin that combines all three. First up, there's the 7X-500 FET compressor, which Lindell says provides its own take on the classic '1176 sound'. The PEX-500 is a Pultec-styled EQ that promises a silky high end and a punchy low end, while the 6X-500 emulates a mono/stereo channel transformer coupled preamp and passive 2-band EQ. Each of these plugins is available in 32/64-bit RTAS/AAX/VST/AU formats for PC and Mac priced at £59/$99/€79. Channel X, which gives you all the plugins separately and offers them as a full channel strip, costs $249. You can find out more on the Lindell Audio website.